Lori's Purple Giraffes: Keeping with the Bright Theme! Keeping with the Bright Theme! This week at Kaboodle Doodle, the challenge is to make anything but a card and at Our Creative Corner the challenge is to make something 3D. 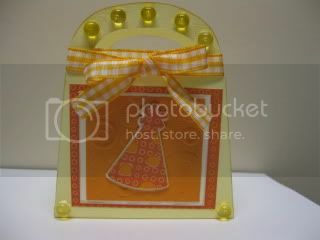 I combined it with The Cuttlebug Spot Challenge which was to make a party favor and of course use embossing. I made this little gift bag (and I mean little!) but it's perfect for little party favors or goody bags for a party. I used the Tags Bags Boxes and More cartridge. The party hat is made from the Doodlecharms cartridge and I used the Spots and Dots embossing folder. The colors I used are from this week's SPCC Color Challenge : So Saffron, Very Vanilla and Only Orange. Love it. This would be perfect for a shower. When I have to participate, eventually, im Maggie's wedding planning -- I might hire you to make gift bags! What a lovely idea for a party bag - so bright and cheery. Thanks for joining in with the Kaboodledoodle challenge. It's so cute!!! I love the bright colors and the embellishments on the strap are perfect! OMGosh! Great job rocking all of the challenges! Thanks for joining us at SPCC! Love it Lori - you crafty chick you!!!! I totally need that Spots and Dots folder!! This little party bag is so cute! I love how it has a lot of charm and personality, but still could be easily mass-produced for a large group. Perfect! Super cute project Lori, LOVE the pretty paper and added dew drops! You did great with a tough combination of challenges. Thanks for using SPCC colors. What a lovely project!! So glad you joined us this week at SPCC!! This is absolutely adorable and so great for party favors! Love the creativeness! Thanks for joining us at SPCC this week! Super cute, lovely colours and what a great little project. Thanks for joining us over at Kaboodle Doodle.